In a large pot cover corned beef with cold water and bring to a boil. 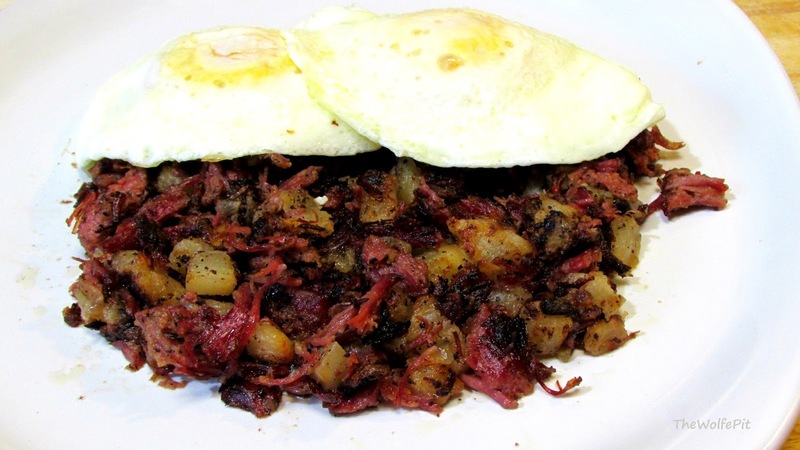 Reduce heat to medium low and cook corned beef until tender 3-3.5 hours. Removed corned beef from water and let cool. Remove excess fat, cut into cubes or finely chop, your preference. Boil Daikon radish in salted water for 10-12 minutes or until fork tender. In a large skillet over medium heat add corned beef, onion, radish, salt, pepper, garlic and mix well until the fax begins to render from the corned beef. Press the mixture down into the bottom of the skillet to help form a crispy golden brown crust, add pads of butter to the top and let it cook for 5 minutes untouched. After five minutes, mix again and repeat 3-4 times until it reaches your desired golden brown and crispiness. Serve with poached or over easy fried eggs.